I survived this year's garage sale. I feel it was a success. I would have liked to have made a little bit more than I did, we did very well for not having any high value items. The most expensive items in this sale were $10. While it was a bit sad seeing the kids toys being hauled away, it warmed my heart to see them going home with little kids who will enjoy them once again. We were definitely glad to have this tent for shade, especially on the last day of the sale. It was sunny all three days, but the temps went up by several degrees each day. Thursday was the busiest day by far. It also had the best temperatures in the mid 70s. On Friday, the crowds were a bit smaller, and the weather a bit warmer in the 80s. Saturday morning was super slow, but traffic picked up in the afternoon. It was also when the weather was sweltering at 92 degrees. Whew, we were feeling the heat on that day. If you have a lot of small plastic toys like we do, here is a fun idea to try at your sale. Place them in a basket and sit it in a location where kids can easily look through them. The toys will keep the kids busy, so parents can look around, and there is a good chance that they will be allowed to bring one home. Our best customer was a little girl about 7 years old. She was so excited when she saw all of Kara's toys. She had so many items that her mom had her put some of them back, because she wanted way more than she had money to spend. She ended up with a Barbie lap top, a crown, a Selena Gomez photo album, a bunny water bottle, an Etch a Sketch, and a starfish. (I gave her a bit of a price break for buying so much!) She had to use one of chairs to hold of her finds while she was busy shopping. I was so happy to sell this toy. I even apologized to the mom when her son picked it out because it never stops talking. It is a matchbox track that says.. "who dares to wake the mummy" over and over again. It has a sensor, so it was easy to accidentally set it off. She was about to become a 3rd time mom, so she knew what she was getting into, and told me she would make him keep it in his room. Having a lot of garage sales, you get to know the types of shoppers that you will see during the day. When grown men basically jump out of their cars and run as fast as they can to the sale, you know they are looking for tools or parts. It is actually kind of funny to see their reaction when they see all the toys and the fact we have no tools to sell. Another type of shopper we have seen (also usually men) are people looking for deals that they can buy dirt cheap, and resell on Ebay for a profit. They usually show up first thing in the morning. I had an experience with one of these shoppers before at a previous sale. I had a large plastic container filled with about 50 children's videos. They were marked $1 a piece which was actually quite reasonable. On the very first day of the sale, just as we were opening, he asked if he could take the entire container of videos off my hands for $5. Um, NO! The container itself was worth $15. He didn't even have kids with him, so I knew he was looking to resell them. I went on to sell many of those videos for $1 each, and still have my container. My favorite type of customer is the young family with kids who are looking to save some money by buying used items, or grandmas looking to by things for their grandchildren. They usually can find something they want to buy. Last week when I was preparing for our sale, I asked some of my blogging friends for their favorite tips. 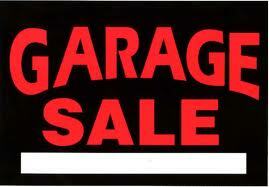 Some of them consider themselves garage sale veterans, and had some great ideas and posts to share. If you are looking to have a sale, or go to a sale, these tips are for you. Merissa from Little House Living, has several garage sale articles that are quite helpful. Rebecca from Franticmommy also has some good garage sale articles to share. Monika from Life with Lovebugs sells muffins from the Costco bakery to her shoppers and sells out every time. This is a great way to keep the customers happy and make a little bit more money. Laura from Now Things are Cookin' says to be prepared to bargain. She is the type of seller who wants to get things out of her house. When you find a sale with a motivated seller, you find some really great deals. You can read even more of my favorite tips here, and here.